This is the Jack the Station Cat website. Here you can find out a little bit about Jack, who lives at Tails End Station with his friends. His adventures are being retold in books by his human, Alan Cliff, for us all to share. Jack enjoyed posing for photographs and portraits! He lived with his humans Alan and Rosemary Cliff in North Wales, and inspired Alan to write about his adventures in a series of books now published by Gwasg Helygain. "Holy War, From Llanberis to Llanuwchllyn"
Alan Cliff's first railway book for adults, "Holy War, from Llanberis to Llanuwchllyn" is now available, post free, from Jack the Station Cat Ltd. The cost of the book is £3.00 and it can be autographed by the author free of charge- please provide details when ordering. "Holy War", named after a racehorse whose story has long been forgotten, was the last narrow gauge steam survivor in a Welsh quarry and is the only Welsh narrow gauge loco to have flown! 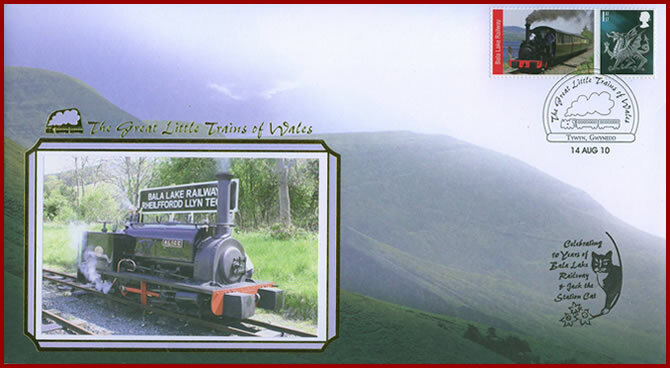 Read this delightful booklet about a little unforgettable locomotive. 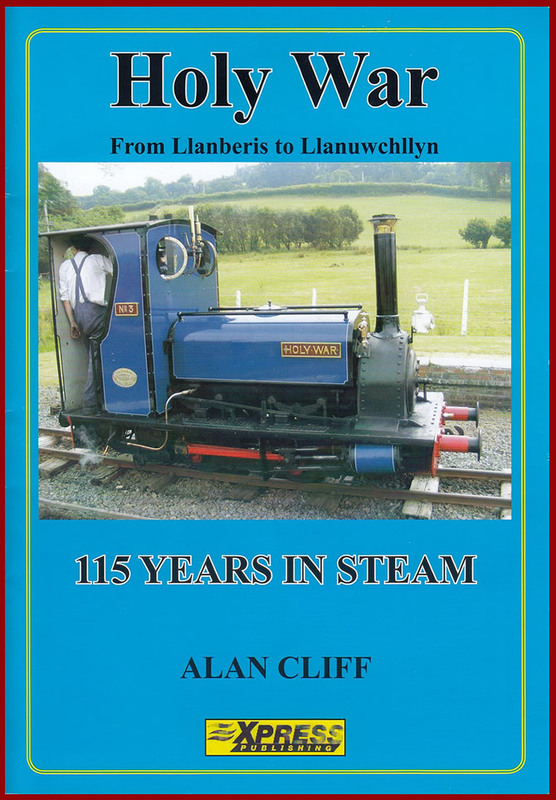 Now 115 years old, the book celebrates her life from 1902-1967 in the Dinorwic quarry to her new life 1975-2017 on the Bala Lake Railway. 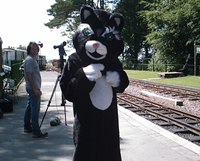 The new Jack Book, "Jack the Station Cat Takes a Holiday", is now available, post free, from Jack the Station Cat Ltd.
J. Toddington Ramsbottom, proprietor of Ramsbottom's Rapid Removals and friend of the Station Master at Tail's End station, needs a holiday. 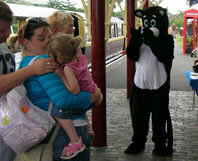 He invites Jack the Station Cat and his relatives to go with him. Dorset and the Swanage Railway is their destination. 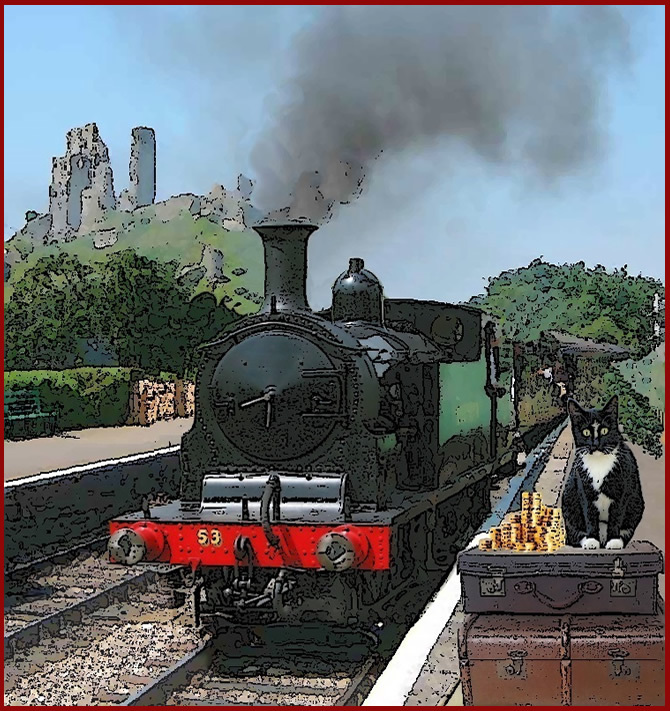 Sir Bedivere, the Station Snail at Swanage, has a mysterious message for Jack: "Mr Ramsbottom on a secret treasure hunt. Watch out for Eli Clutterbuck." What does this mean? Jack and the other cats intend to find out. A Cat with a Mission supports charity literacy campaign in Wales. On 1 October 2014, leading charities, organisations, teachers and children’s authors launched a national mission in Wales to get all 11 year olds reading well by 2025. The coalition called Read On. Get On, Darllena.Datblyga in Welsh will galvanise the nation to play its part in making this happen. Alan Cliff, children’s author from Rhyl, has lent his support by writing a ten minute story for the UK wide literacy campaign called ‘Jack the Station Cat: Special Agent ‘ a new adventure for his much loved feline friend . Reading is the key to a child’s future; it unlocks their potential and opens up a world of opportunities. However, every year, four in ten (40%) of pupils in Wales still arrive at secondary school with reading ages below their chronological age [Estyn 2010-11 report]. The recently published Welsh Government National and Numeracy test result also showed that children living in disadvantaged areas did less well with their reading than those in more affluent areas. • 73% of 8 to 11 year old girls said they enjoyed reading compared to 59% of boys. • Children are not reading enough outside school, or with their fathers. Five year old children whose fathers read to them daily will be almost half a year ahead in their reading a few years later, than a child read to less than once a week. In support of the mission a number of acclaimed Welsh children’s authors including Jon Gower, Jenny Sullivan, Alan Cliff, Dan Anthony, Elen Caldecott, Caryl Lewis, Bethan Gwanas, Elin Meek, and Manon Steffan Ros have provided exclusive 10-minute reads that can be enjoyed by children and their parents. Attention Railway Modellers, Young or Old! 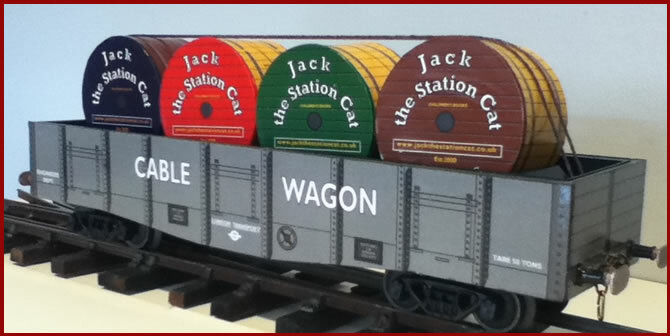 Model maker Graham Lock has designed an "0" gauge "Jack the Station Cat" Private Owner road/rail container. It fits both coarse scale and tin-plate flat wagons such as those by Hornby, Bassett- Lowke, etc, and modern finescale conflats. The model sits perfectly on Corgi Classic 1:50 lorries and the wooden 1:50 models by Paul Anderson. The container is available in a variety of colours. Price is £12.00 plus £1.00 P&P. Each container has its own labelled box. The containers are available from the manufacturer, Graham Lock, on +44 (0)7903 676177 or grhmlock@yahoo.co.uk . Update! Graham can now supply "0" gauge Jack the Station Cat cable drums in a variety of colours. Price is £3.50 plus postage for one drum or £3.00 each plus postage for two drums or more. 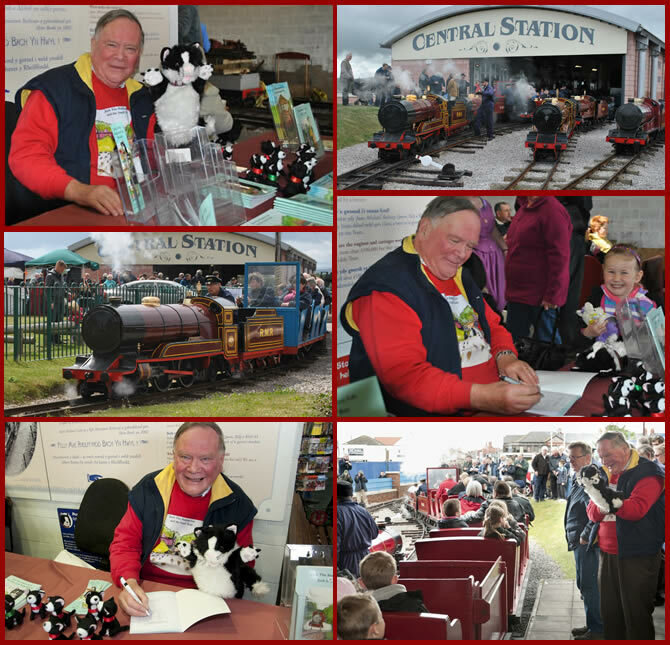 Alan and Jack attended Rhyl Minature Railway's centenary gala celebrations in May and were kept busy signing books! They would both like to extend their congratulations to the railway on reaching this amazing milestone! Over 4,400 passengers were carried by the railway over the Centenary Gala. Thanks to David Hunter of Dalton Video, Rhyl, and to Tatsutoshi Okuda for the photographs. This first day cover featuring Jack the Station Cat and the Bala Lake Railway is a limited edition of 250 by Buckingham Covers. The narrow gauge locomotive on the railway stamp is Holy War. With the remains of Alice, whose photo is in the left hand corner of the cover, Holy War was brought back to Wales and the Bala Lake Railway by Alan Cliff in 1975. When steam finished at Dinorwic Quarry Llanberis, where they had worked all their lives, the little engines were sold and lived at the Quainton Road Steam Centre Buckingham until "repatriated". The picture of Jack the Station Cat in the right hand corner of the cover is from the Jack book, "Jack the Station Cat and the Great Little Trains Robbery". This story features "Holy War". early twentieth or nineteenth centuries The Bala Lake Railway and Buckingham Covers have created history. The credit for unearthing this piece of philatelic/literary history goes to Marci Jarvis Editor of "Cat Mews".the award winning Journal of the Cats on Stamps Study Unit. Jack's first day cover is available for £11.00 including delivery directly from Jack the Station Cat Limited at the address listed on the books page. 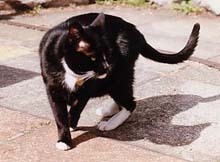 Payment should be made by cheque/postal order made payable to Jack the Station Cat Limited. Jack the Station Cat visits the BBC Antiques Roadshow. 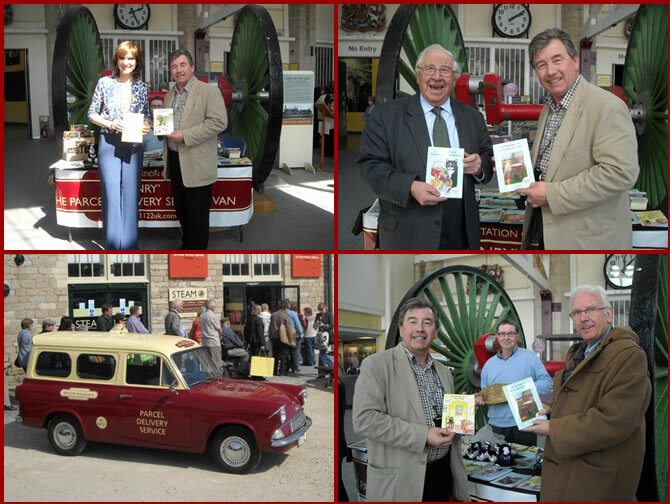 At the recording of the BBC Antiques Roadshow at "Steam" the Museum of the Great Western Railway, Swindon during April 2010, Jack the Station cat had the pleasure of meeting Fiona Bruce, BBC News Reader and Presenter of the BBC Antiques Roadshow and ceramics expert Henry Sandon who is one of the longest serving members of the Roadshow's team of experts. Pictured with Fiona and Henry is Neil Booth Of Railwayana Auctions UK whose preserved British Railways Parcels van was the inspiration for Henry the Van in the Jack the Station Cat books. Also pictured is Pete Waterman the music impresario, a well known railway enthusiast, who like Neil Booth and his van was a guest at the Antiques roadshow recording. Jack is now on Facebook! Jack would love to see you on his Facebook page. Click here to say hello! If you want to hold an event, please see our events page or click here to email us. 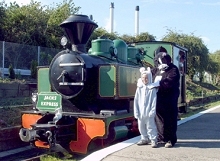 Jack gets about – here he is at the Sittingbourne and Kelmsley Light Railway, Lynton and Barnstaple Railway and Bala Lake Railway.